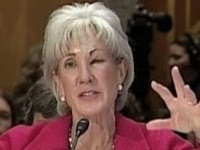 As it turns out, Kathleen Sebelius is not that smart or capable. The difference between, say, me and politicians? I never once thought that Kathleen Sebelius had it in her to successfully launch a government takeover of one-sixth of the U.S. economy. Put aside everything that is morally, ethically, Constitutionally, logically wrong with Obamacare. I'm not even talking about that, though Obamacare is an abomination. I'm talking about the laughable, though common idea that someone whose sole skill in life is being a politician is capable of successfully running anything but a campaign. It's crazy, but this is how we do things in the good ol' U.S. of A. If you were in Congress and you managed to back the winner in the race for Presidency, you likely have secured yourself a spot as the Secretary of Homeland Security/Health and Human Services/Agriculture/Labor/State/We Have Too Many Departments. We do this in Kansas, too. Our state departments are filled with political has-beens padding their resumes. I am not saying any of them are doing a bad job, but should we really be expected to believe that the best person in the state for the role of say, Labor Secretary, is Lana Gordon? I'm not knocking her, but she was a teacher. And then a legislator. How exactly do those skills translate into running a department with the primary responsibility of overseeing unemployment claims? If there was an application system for the job -- instead of a Friend of Sam Brownback requirement -- the experience listed on her resume wouldn't have even garnered Gordon an interview. So Kathleen Sebelius got her job on the federal political stage, first, by being a politician. Scratch that. First, by being the daughter of a former Ohio Governor and marrying the son of a former U.S. Representative. So, she's Kansas' version of Paris Hilton -- living on the work of others. She parlayed her relations into a political career -- serving as a Kansas state representative. And, then, she ran and successfully became Kansas Insurance Commissioner. I have NO idea how this happened. Did the Republicans run a turnip for insurance commissioner in 1994? Anyway, so Sebelius managed to win a few elections, and somehow only BARELY drive the state off the fiscal cliff. Prior to running for office, and I guess marrying well, she was a lobbyist for the American Trial Lawyers Association. Naturally, when it came time to name someone to what would become the Second Most Powerful Human in America behind President Obama -- the president picked Sebelius. She'd been an early supporter of his campaign -- ditching whatever loyalty a set of ovaries and matching pants suits got Hilary. As Sebelius' reward, she was eventually, though not immediately, tapped for the Secretary of HHS. It's been nothing but a disaster ever since. Despite the cries that Sebelius was tied for 20th Most Popular Governor in America at one time (which I don't actually buy, but still), the Drudge Report is today calling her the Most Hated Woman in America. As for her testimony today, it showed, in technicolor detail, just how out-of-her league she really is. At one point, Sebelius described to the committee (of federal legislators) exactly what made Obamacare a law instead of a bill. And so I'll rest my case. Her answer to questions about the dire Obamacare rollout involved detailing something that anyone who has ever memorized a Schoolhouse Rock song could tell you. How stupid do we look? Bob Dole -- Please Stop.